When you’re looking for the best truck accessories near me in Mesa, Chandler, Gilbert, Tempe, or Phoenix; Cliff’s Welding is here to help! Our team understands all of your truck, towing, hauling, and need for quality truck accessories. Truck accessories we sell and install include: tool boxes, auxiliary fuel tanks, all weather floor mats, running boards, nerf bars, truck bed covers, mud flaps, cargo carries, bike racks, motorcycle carriers, exhaust systems, suspension upgrades, generators, banks power, and more! 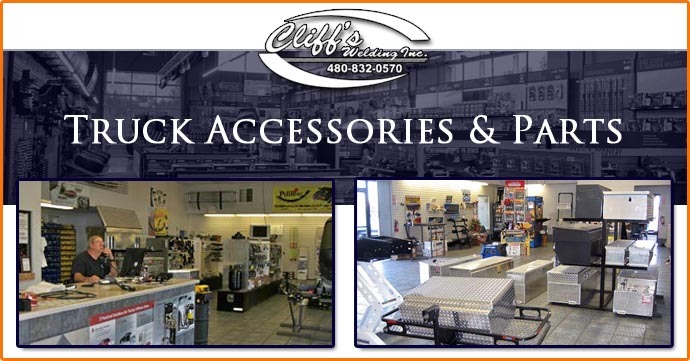 Stop by our Truck Accessory Showroom in Mesa, Arizona to see all of the options available from Cliff’s Welding or give us a call today at 480-832-0570. Truck accessories describe parts that are many times not installed from the factory. Each new vehicle dealer orders trucks exactly how they want them to come. This includes if they have assist steps, spray in bedliners, quality mudflaps, and even something as simple as a receiver hitch. 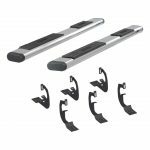 Running boards make it easier for passengers to get in your truck, add visual style, and also help prevent some rocks from kicking up and hitting the vehicle on the highway. They are an investment in protection and style. We sell durable running boards and nerf bars to fit your truck. If you travel in the mountains at all you know that deer don’t look both ways. Grille guards help protect your radiator, headlights, and everything in the front of your truck in the event of an impact. 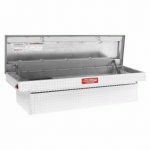 This can also be a great addition for anyone that uses their truck for working livestock. It gives additional space for the addition of more lighting and many styles include additional points to hook up chains for working in the field. 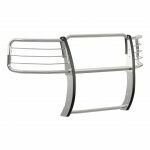 Grille guards are made from steel or aluminum depending on the purpose and design. 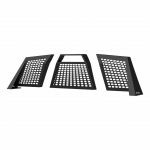 The heaviest duty grille guards are full bumper replacements that are welded to the frame and become a permanent part of the truck. Headache racks help protect the cab when hauling. Whether it’s furniture, lumber, or appliances a headache rack protects your cab glass from getting damaged. If a 2×4 comes loose or something your’re hauling shifts and falls, the metal headache rack takes the impact, prevents the glass from breaking, and protects passengers in the vehicle. Auxiliary Fuel Tanks are the answer for extending fuel range and providing fuel for recreational vehicles. These tanks can be connected directly to the vehicle to provide a longer range tow. They can also be made to house fuel for motorcycles, ATVs, snowmobiles, or whatever type of off road recreational vehicles your family loves to ride. Pump assemblies can be added to make fueling these off road toys even easier. Tool box auxiliary fuel tank combinations are available. You will have extra fuel on hand for those deep desert adventures, and a place for your tools, all in one. 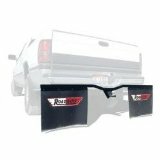 Mud Flaps aren’t just for the vehicles behind you, they are the law in many states. They help keep the rocks from flying up into the windshields of other motorists. They can be very useful for keeping your truck and trailer clean too. They block the spray of the road from flying directly up on your tow vehicle. Keeping it cleaner and having less dents from road debris. For longer trips, or for families that simply don’t want to have to have their gear in the RV or truck a cargo carrier can be a great solution. 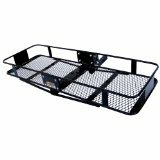 These carriers can be installed just like a hitch or custom carriers can be installed. These are the best place for hazardous items, like gasoline or propane. Keeping gas cans out of the vehicle or RV keeps the fumes out of the living or driving area. If you use your truck to work in the field, use your vehicle to tow, or are any kind of tradesman you have a bunch of tools that you want to have in the truck. Throwing them in the back seat and on the floor might be easy, and a good idea for high value electronic equipment, but it gets in the way. Hand tools, tie straps, and chains clutter the truck and ruin the interior. It is best to have a dedicated, lockable place to put your tools and chains. There are different depths, and widths to fit your truck and your needs. Many can also be bought to include optional fuel storage. 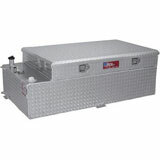 These fuel tool boxes will have a pump and integrated tank as part of the toolbox. There are usually a couple of places you can hook your straps or rope when you are transporting cargo with your truck. Tie-downs are accessories that fit into optional locations in the truck bed and lock into place to give you greater flexibility and additional points to tie down to. This means that the cargo will be more secure and have less chance to break free or rub against the bed of the truck and damage it. 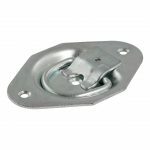 From simple trailer hitches to robust gooseneck hitches we sell and install the best to provide our customers with the latest and greatest in towing accessories. Whether it’s a trailer that you’re towing your ATVs or boat out for fun or you’re taking care of business with a construction, landscaping, or plumbing company we have the hitches you need. We also specialize in RV towing equipment. No matter if its recreation or all business we have what you need to establish a rock solid towing platform. Read more about: towing accessories. Cliff’s welding carries a wide range of truck accessory products for every size of truck. Customizing your truck the with latest and greatest accessories makes them more comfortable, more useful, and better organized. The accessories listed our the site are just a sampling of the selection we have that can be professionally installed. Adding accessories makes the truck more useful, works harder, increases the value, and in many cases helps the truck lasts longer. Something as simple as adding some tow hooks makes it so a truck owner can simply hook up some chains and have a fellow motorist or friend pull them out, which is faster and cheaper than having to call a tow truck. Some jobs that require the transportation of large items, such as appliances or agricultural equipment require truck accessories to be done safely. If you have to get that new refrigerator back to the house having some tie downs or anchors makes it safer to get the job done. 5 Star Review On Google: “I have used these guys several times over the years. I just had them build a ladder rack for a work truck of mine. It turned out so good I had to write a review. It’s not often you see people get rewarded for quality work. everyone wants to bag on companies if they let you down. These guys have never let me down and I’ve been there for all kinds of stuff that I don’t know where else to go. Things like my ladder rack, trailer wiring, boat lights not working, and rv repairs. These guys do it right.” – Daren L.
We proudly carry and install the very best truck accessories anywhere. With our professional expert help you will be able to choose the very best fit for your truck, budget, and accessory need. If you have questions please give us a call at 480-832-0570.or Stop by our Truck Accessory Showroom in Mesa, Arizona at 4007 E Main St, Mesa, AZ 85205 to see all of the options available from Cliff’s Welding. 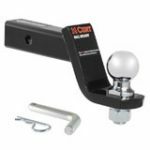 Cliff's sells and installs a wide variety of truck accessories that help with towing, safety, improve style, and performance.